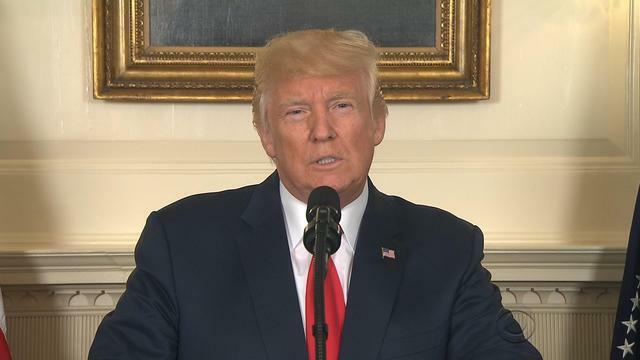 President Trump on Monday explicitly called out and denounced white supremacists by name after the domestic terror attack and violence that erupted in Charlottesville over the weekend. "Racism is evil and those who cause violence in its name are criminals and thugs, including the KKK, neo-Nazis, white supremacists and other hate groups that are repugnant to everything we hold dear as Americans," Mr. Trump said in remarks from the White House's Roosevelt Room. The president, who had just met with FBI Director Christopher Wray and Attorney General Jeff Sessions, said that the Department of Justice has opened a civil rights investigation into the deadly events on Saturday. He said that anyone who acted criminally will be "held fully accountable." "We condemn in the strongest possible terms this egregious display of hatred, bigotry and violence. It has no place in America and as I have said many times before, no matter the color of our skin, we all live under the same laws, we all salute the same great flag, we are all made by the same almighty God," he said. The president named the three people who were killed on Saturday: Heather Heyer and the two Virginia state troopers who died in a helicopter crash, Lt. H. Jay Cullen and Trooper-pilot Berke M.M. Bates. His remarks occured after the president came under fire for the way he handled Charlottesville two days ago. Mr. Trump on Saturday condemned hatred "on many sides," which prompted backlash from both Democrats and Republicans alike. The president arrived to the White House Monday morning from his vacation in Bedminster, New Jersey, for the meeting with his two administration officials and for a few other meetings. He'll head to New York on Monday evening and is expected to stay over at Trump Tower for the first time as president.